Since his TV-movie Duel 40 years ago, we’ve known director Steven Spielberg as a master manipulator, but he left his bag of tricks at home for his new film, Lincoln. Mr. Spielberg directs this film with restraint, his presence subtle; he lets the words and the pictures and the actors tell this sadly joyous story. Tony Kushner’s script is warm, deep, and utterly brilliant. Messrs. Spielberg and Kushner worked with Doris Kearns Goodwin’s book, Team of Rivals: The Political Genius of Abraham Lincoln, focusing the film on the last four months of Lincoln’s life, when the most important thing in the world to him was to abolish slavery permanently, through a constitutional amendment. Passing the amendment before the end of the war was vital, since the Confederate states, once reunited with the Union, would never allow it to stand. But this is not a documentary. 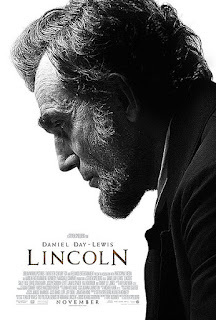 Lincoln does with history what good films and plays must: It condenses people, time, events, and cuts to the chase. Daniel Day-Lewis as President Lincoln. Lincoln is a work of art. Its scenes are filmed and lit with a painter’s palette of natural and somber hues, as if a gray gauze lay over the land and the people, inside and out. Cinematography by Janusz Kaminski is beautifully composed and moving. The enormously talented group of people who put Lincoln together left me awestruck — from the costuming by Joanna Johnston, to the production design by Rick Carter that complements the art direction and set direction and the whole. John William’s music is discreet and fitting, film editing by Michael Kahn is masterful, casting by Avy Kaufman was piercingly on the mark. Daniel Day-Lewis was Abraham Lincoln. He was possessed — in a good way — as if Lincoln had heard this man searching for him, and said, “At last. Someone who really gets me,” and proceeded to inhabit Mr. Day-Lewis and speak through him for the duration of the film. I could listen to Daniel Day-Lewis channeling Lincoln via Kushner all day long. Sally Field gave us a Mary Todd Lincoln with whom we could empathize even when Mrs. Lincoln grated. Bruce McGill inhabited a stressed and tough Secretary of War Edwin Stanton. The elder statesman of our theatre and film worlds, Hal Holbrook, was a tough old bird, Preston Blair, whose behind-the-scenes machinations for a negotiated peace brought the story to crisis. David Strathairn was the wise and restrained Secretary of State, William Seward. 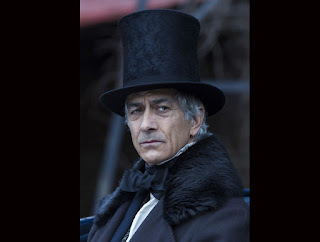 Seward handles the political manipulation that Lincoln doesn’t want to touch, the trading of positions for votes, employing three slightly scurvy wretches gorgeously played by the highly skilled and unexpected instruments of James Spader (in the most delightful impersonation I can recall seeing him take on), Tim Blake Nelson, and John Hawkes. Fighting the fight on the legislature floor, his sad basset hound face heavily lined beneath a heavy wig, Tommy Lee Jones had a fine time playing irascible and intimidating Thaddeus Stevens. Jared Harris’ Ulysses S. Grant was subdued and powerful. Lee Pace is a furious opponent of the amendment as Democrat Fernando Wood of New York, and Michael Stuhlbarg gives a finely tuned performance as George Yeaman, a Kentucky representative torn between what he fears will be the long-term results of passing the amendment, and his certainty that its passage is morally right. Tommy Lee Jones as Thaddeus Stevens. (c) 2012 DreamWorks and 20th Century Fox. There are no lackluster performances. There are no lesser scenes. This film is gripping from beginning to end. The night I saw it, the audience applauded as the credits rolled. 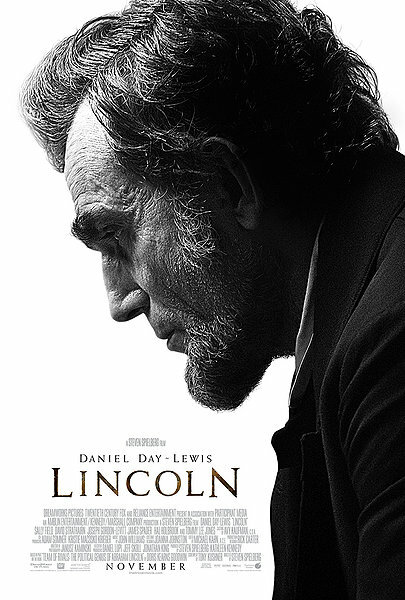 Still not a documentary, Lincoln nevertheless is an excellent lesson in how politics works, in how compromise makes change possible. Yet the film does not let us forget the horrors of war — the hands-on and hand-to-hand kind. We see President Lincoln torn between a possibility that he might negotiate a peace, potentially saving thousands of lives, or passing a monumental amendment that would save many thousands more — as well as the American soul. Lincoln used Euclid’s axiom “Things equal to the same thing are equal” to prove, logically, that all people are equal to one another — this in a late night conversation with young men in his employ. Not politicians. Not statesmen. Just people. This is the man the film is about, and this the moment that evokes the man….. The only audience to whom I would not recommend this film are young children. It was not made to excite with guts and gore. Its scenes of war evoke horror as they ought. I cannot emphasize enough how brilliant and serious this film is. Go see it on a big screen. Then see it again. “It's time for me to go. But I would rather stay,” Lincoln says to his cabinet as he leaves for Ford's Theatre. We’d rather he’d stayed as well. 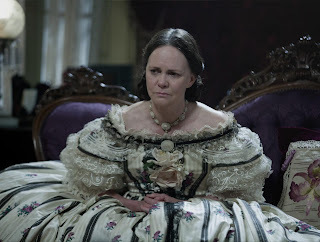 ~ Molly Matera, signing off, looking for the next showing of Lincoln.